What do Walt Disney, King Arthur, and the Illuminati have in common? Find out in this pioneering new book by Dr Frank Albo. Astana - Architecture, Myth, and Destiny provides an entirely unique perspective on the three most important issues of our time: environmental pollution, religious extremism, and the proliferation of nuclear weapons. 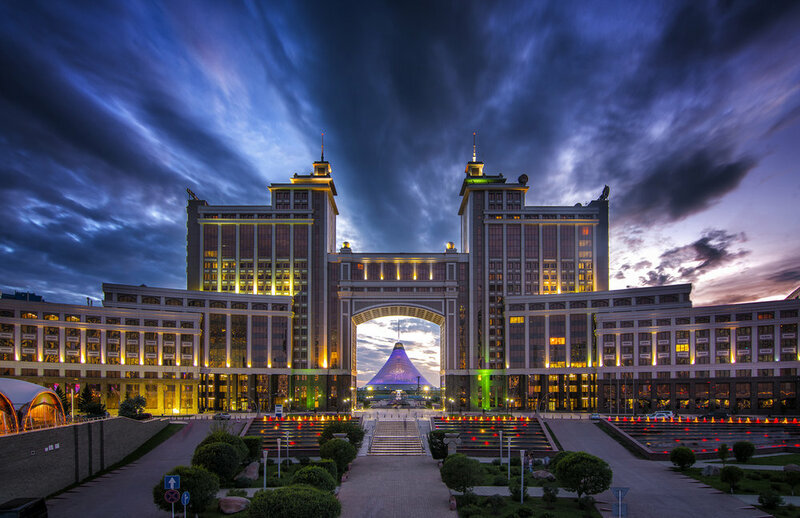 Find the hidden message in the Astana: Architecture, Myth & Destiny to win a luxury vacation to the so-called "Illuminati Capital in the World." Visit www.astanamyth.com/challenge for details. Online magazine, Atlas Obscura, has added this trip to their catalogue of unusual and obscure travel destinations. Is the Manitoba Legislative Building a Masonic Temple in disguise? Why is Winnipeg called the “Ectoplasm Capital of the World?" And what is it about this region that makes it such a hotbed of supposed supernatural phenomena, from UFO sightings to encounters with Bigfoot? We’ll travel on horseback to the best-documented UFO landing site, participate in a traditional Anishinaabe healing ceremony, and spend our evenings in a notoriously haunted historic hotel. Along the way, we’ll dine on the finest Manitoba cuisine, from pickerel cheeks to bison steaks, while getting used to hearing Bigfoot stories swapped about as lightly as small-town gossip. Architectural wonders, spiritual mysteries, ancient ceremonies, cryptozoology, and more await you on this five-day exploration of Canada’s enigmatic heartland. This book lays out a foundation myth encoded into the breathtaking architecture of Astana, the capital of Kazakhstan. An omnibus of archaeological discovery, architecture, folklore, and code-breaking symbolism, Astana advances challenging ideas and offers a wealth of fresh insights into the hidden history of one of the most remarkable cities on Earth. It presents Kazakhstan’s role as a harbinger of peace and a centre of stability, adaptability, and security in the world, as part of a pan-national epic concealed in the heart of Central Asia. Combining empirical research with ancient myth and legend, this book provides a unifying approach to the social, cultural, and religious connectedness of humankind. It reveals Kazakhstan’s shimmering new capital to be more than just a symbolic statement marking the birth of a new nation; it instead provides an architectural roadmap for the peaceful destiny of the world. In the geographical centre of North America sits one of the most remarkable buildings in the world. On the surface, the Manitoba Legislative Building appears to be a typical house of government, but beneath its elegant façade lurks a cryptic array of arcane symbols designed to influence the mind. After ten years of painstaking research, Dr. Frank Albo revealed the building to be a library of coded messages and secret teachings. As he pieced together the complex jig-saw puzzle an astonishing pattern emerged - a web of concealment in the original blueprints and in the building’s iconography pointing to a secret plot.